Geology: the scientific study of the formation, history, and structure of the Earth. The Grande Prairie region sits on rocks of the Wapiti Formation. These rocks span a period from 80 to about 69 million years ago during the Campanian and Maastrichtian epochs of the Late Cretaceous period. It covers an area from Edmonton to the eastern edge of British Columbia. 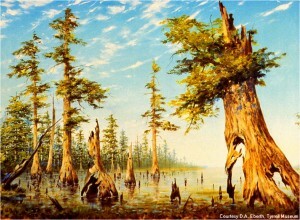 Geologists have interpreted the environment of the Wapiti Formation as a low floodplain covered in meandering rivers, lakes, and swamps, although this environment shifted a great deal over that 11 million year duration. The climate would have been much warmer than it is today despite Grande Prairie actually being further north than its current location. In fact, Grande Prairie was almost at the Arctic Circle at this time. Being so far north, the region would have experienced long winters and short days; however, there was little snow or ice. During the Cretaceous, North America was essentially divided into east and west subcontinents by a warm, shallow inland sea. The Bearpaw Sea, as it is referred to, brought life and warmth right up to the Arctic Circle. Mountains to the west supplied rivers that streamed across the green floodplains and into the sea, which supported the roaming herds of hadrosaurs and ceratopsians, as well as a diverse array of other dinosaurs such as tyrannosaurs and ankylosaurs. The Grande Prairie region was located near the centre of western coast of that seaway, in the middle of a broad floodplain. Geologists are able to make accurate maps of the underground geological profile through the use of drill cores and a range of remote-sensing methods, which include seismic and gamma (radioactivity) techniques. Remote-sensing works similar to sonar navigation used by dolphins or bats; the differing densities of the rocks underground reflect sound waves at different speeds, which can be converted into an image on a computer at the surface. These techniques are important for palaeontologists, geologists, and industry in reconstructing the earth’s history and its ancient environments but also in knowing where to look for commodities such as oil and gas.